If you’re contemplating an Australian holiday to take advantage of our hiking trails, you’re certainly going to be spoiled for choice. One of the biggest perks to a country as large and as open as Australia is that there are so many fantastic hiking spots, regardless of the capital city or state you’re staying or living in. In this post, we’ll take a look over some of Australia’s most amazing hiking trails and outline a few great tips for each one. Take a look below! Up first on our list is one of Queensland’s most popular and more challenging trails, the Scenic Rim Trail. This hiking trail is fantastic for all hikers and comes with guided private hikes lasting from two to five days so you can be sure that you’re getting the most out of the hike. Be sure to visit between March and November though as these are the walking season dates. The trail follows in-between and alongside some of Queensland’s most famous mountain ranges including the Great Dividing Range and Tamborine Mountain. That said, you can be certain that there’s plenty to see during your hike. If you take the five-day hike, there are even cabins perched quite literally in the rainforest, given you a much-needed space to take a load off. You can check out the Scenic Rim Trail’s five-day itinerary here. If a more coastal hiking trail takes your fancy, then nothing comes close to the world-renowned Twelve Apostles hike. The guided hike spans four days and will have you hiking from Castle Cove down to Princetown and the Twelve Apostles. This hike is extremely unique in the sense that you’ll be routinely switching between hiking on the beach and the thick vegetation on the cliffs above. This way you’re getting a great view from the sand, but also from the bush and cliffs well above the sea. There’s also no need to set up camp on this hike as you’ll be able to stay in the awesome bungalows and cabins, which you’ll find surprisingly refreshing after a 14.5km walk on your second day of hiking. For more information on the hike and its itinerary you can take a look here. A trail that we recommended for seasoned hikers only is the near-month-long trek across the Larapinta Trail in the Northern Territory. Spanning over 200km, the Larapinta Trail covers some of Australia’s last truly untouched landscapes and gives hikers a true look back in time at some of the oldest mountain ranges on the planet. As the trail is located in the centre of Australia, temperatures can soar beyond the 40s and dry air will have you dehydrated very quickly. We suggest planning well-ahead and making the hike in the cooler months, from April to September. If you do intend on going it alone, or with a friend, we urge you to triple check that you have all of your hiking items packed and have followed a guide to packing a backpack. The trail is notorious for being difficult and having a lack of essentials isn’t an option. A satellite phone is also recommended. It’s also important to work out whether you’d like to walk the entire 223km trail, or just walk a section of it. The trail is broken into a few sections and there are options that enable you to walk just a portion of the trail before finding your way back to the car. You can find some more information on the Larapinta Trail here. Making our way down to colder country now, the Cradle Mountains walk in Tasmania is arguably Australia’s best temperate climate hiking trail. Spanning six days, the hike cuts through Tasmania’s Cradle Mountains, crossing crystal clear rivers, winding through pine tree forests and wide open grasslands and a whole lot more. Something that will dazzle even the most experienced Aussie hikers is the trail’s ability to change scenery so rapidly in a short period of time. You’ll be walking below snow-capped mountains and suddenly find yourself deep within a forest and in a few more hours you’ll be engulfed by arid, tundra-like wastelands. For the hike’s itinerary and more information take a look here. Moving across to Western Australia now, you’ll find the Cape to Cape Track a few hours drive south of Perth. The walk can last up to eight days, however, the amazing views of the sea and WA’s famous oceanside vegetation will keep the hike feeling fresh and exciting throughout. The entire hike spans just over 120km and cuts through a variety of different landscapes. There are cliffs and caves eroded by the sea, unique wildflowers and even windswept rock faces to take a look at during your hike. You’ll find that there are a few accommodation options along the way, so stopping to check in with civilisation and sleeping on a real bed once in a while is certainly an option. To find some more information on the cape to cape walk take a look here. The wilderness coast walk extends just over 100km, connects Victoria with New South Wales and is divided into three main sections. One of the best parts of this hike is that it’s a moderately difficult walk and features plenty of camping spots along the way. This way you’re provided with an easier space to wash, sleep and prepare food and also a trail that isn’t hard to navigate. Hikers will find that the entire walk essentially runs close by the beach and provides unrivalled views of where the sea meets some of Australia’s thickest broadleaf forests. Another great perk is that you’ll be able to follow along the beachfront walkways and paths for a majority of the walk, which makes things a little easier. One thing to note is that you may need a permit to walk the trail as the national park is looking to limit the level of foot traffic on the trail. For more information on the Walking the Wilderness Coast Walk take a look here. For those looking to descend on South Australia, there’s one amazing hiking trail you can’t afford to miss, and it’s in the heart of the Flinders Ranges. The Arkaba Walk is by far the states best hiking trial and private five-day guided walks make it a perfect choice for beginners. 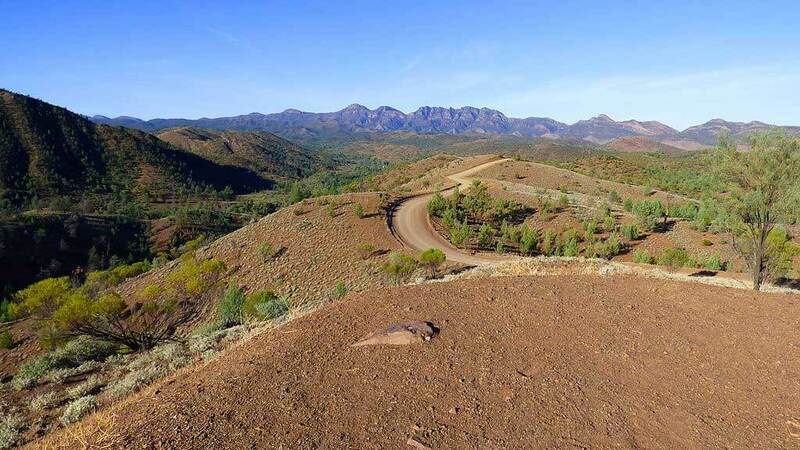 The walk carves through the Flinders Ranges wildlife conservancy and ensures that you’re truly taking in unblemished landscapes. You’ll even have the chance to see hundreds of native animals and more. The hike also takes you up and close to the famous Flinders Range colourful and striped mountains and hills. As a private hike, you’ll have access to plenty of help, accommodation, showers, food and hike checklists. You can take a look at the Arkaba website for some more information on the hike.